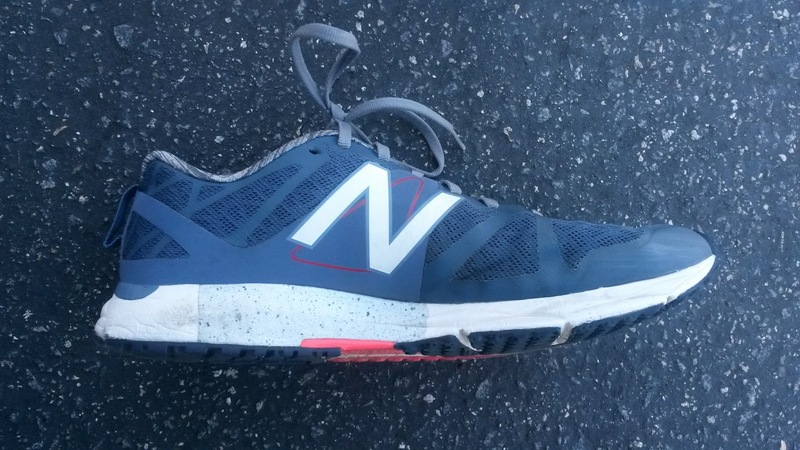 Time for a first: A New Balance review. Today we have the New Balance 1500v1 on deck. I have had this shoe for quite some time and am on my second pair. 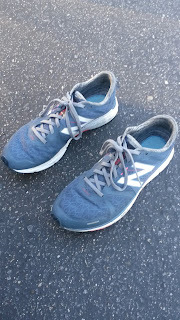 I did not know what to expect as I have not had great experiences with new balance in the past. I missed the whole Fresh Foam Zante craze because I thought the midfoot was too narrow (so it felt like my foot was falling off the shoe). I did not have great experiences with New Balances first foray in the minimal realm with the Minimus Road (original). However, one of my favorite shoes to this day remain the New Balance 904. A lightweight stability trainer that reminds me of the Adidas Tempo 5 (also one of my favorite shoes). New Balance has recently turned over a new leaf and have been putting out some fantastic shoes. The 1500v1 is one of them. The Vazee series, the new 870v4, the 1400 series, 1600 series and 5000 series are all fantastic. A review of the Vazee Pace and Prism will be up for review in a few months (if DPT school allows), but for now let's take a look at the 1500v1. Sole/Ride/Drop: The 1500v1 is billed as a stability racer or lightweight stability trainer (depending on your needs). It fits right in with the Asics DS Racer and Saucony Fastwitch. There is a minor post in the medial rearfoot/midfoot. It looks like a good sized post but only provides minimal support at most. For those who are sensitive to posting, know that most of the time I don't notice this medial supportive element. It seems to guide the foot nicely rather than forcing a certain transition. As always, posting in racing shoes seems to detract with the rides somewhat due to reducing flexibility. New Balance uses a T-Beam in conjunction with the posting to try to stability the foot, but this ends up just making the shoe a bit stiffer. Not necessarily more responsive but just stiffer. 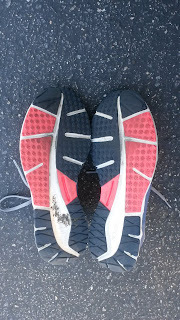 This is the same issue that the Fastwitch used to suffer from (until Saucony removed it and only used second density foam). However, the NB 1500v1 has some pretty great flex grooves in the forefoot and a diagonal lateral heel midsole the help smooth the ride out. The use of diagonal patterns in the midsole, particularly in the lateral heel, are something that I really appreciate. It definitely smooths out the transition of the shoe. The 1500v1 does have a mild heel curve (just like the calcaneus bone of the human foot) but the diagonal pattern allows the shoe to compress nicely during heel strike. This gives the shoe a very smooth roll from initial contact to terminal stance. This may not be the most responsive racer out there, but the ride is very comfortable. This definitely helps make the shoe disappear on your foot during longer runs and races. The drop is listed at 6mm by most websites and that is approximately what it feels like. The lower drop contributes to the lighter and faster feel in general (more on that later). This shoe has emphasized for me how much I like 6mm drop. 10-12 can be a little high, 0-4 is a little low. 6-8mm seems to be just right. Really happy that New Balance has so many options in the 6-8mm drop range and hope that more companies move in that direction. The ride is definitely less firm than the Saucony Fastwitch. The RevLite foam is firm, but has some forgiveness which is nice for longer miles. The ride has also remained fairly consistent throughout the life of the 1500v1. 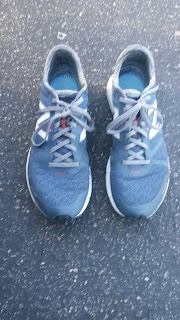 Being lightweight trainer/racers, my first pair lasted 170 miles before I retired them due to sole wear, but during that time they held up well. The nubs on the sole give decent grip on roads and light trails. I'm sure my first pair still have plenty of life on them, but I also needed a casual shoe at the time. I tend to retire my shoes a little early just for injury prevention reasons, so I'm sure most people could get 300-400 miles out of these. 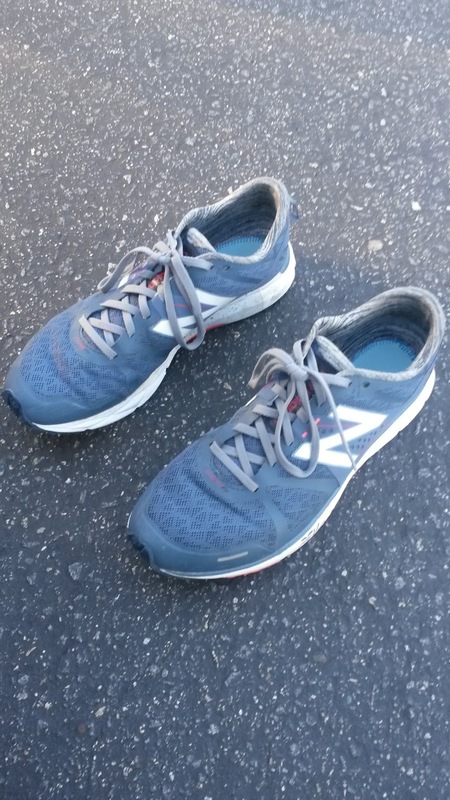 Fit/Feel/Upper: I tend to wear a Men's 10.0 D in most shoes and went to a 9.5 in the NB 1500v1. I found the 10 to be a bit long but the 9.5 gave me a near perfect snugger racing/workout shoe fit. This size seems to be consistent for me across New Balance's racing line (RC 5000, XC 900). The upper seems to fit my foot really well. There is just enough room in the forefoot for me but if you need more this shoes does come in a wide. The heel is a bit loose but this is easily fixed with a lace lock technique. The midfoot does not seem too loose or too tight. The heel does not really have a heel counter. So those of you with sensitive heels, calcaneal bumps, etc will enjoy this shoe. I have not had any issues with heel slippage even with the slightly loose heel and lack of a heel counter. The upper is pretty soft against the skin I have done plenty of sockless runs in this shoe. Version 2 is reported to have an even more barefoot/sockless friendly upper, but version 1 is doing pretty well. I have found that the upper disappears on my foot and I completely forget about this shoe during workouts. Weight/Responsiveness: The 1500v1 is listed at 7.3 ounces and that's how it feels. Lighter than most traditional lightweight trainers and right around the weight of many half to full marathon racers (Adios, DS Racer, Fastwitch, Streak, 1400, LunarRacer and GoMeb Speed). 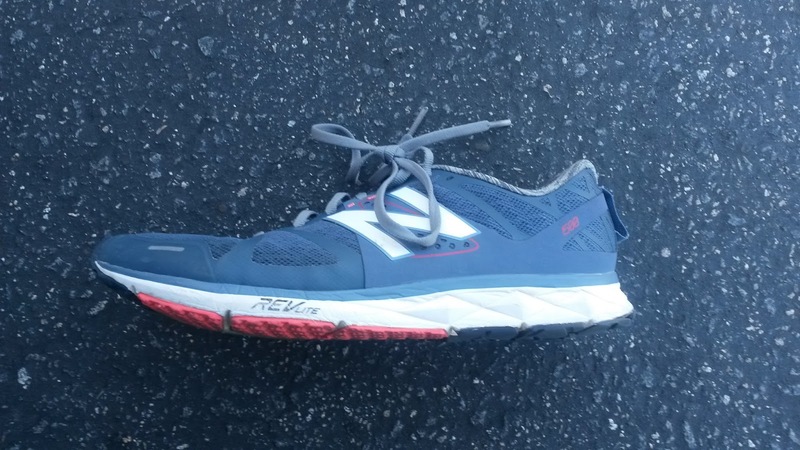 While this shoe is on the better side of responsive due to the light weight, the Revlite foam combined with the T-Beam seems to make this shoe a little more stiff than responsive. I'm not completely sure that those two factors are what contribute to this given that Revlite in the 1400 and 1600 series are great, but those two shoes seem to have midsole plates to increase responsiveness. So really I question the purpose of the T-Beam when there is already midfoot posting to support the foot. 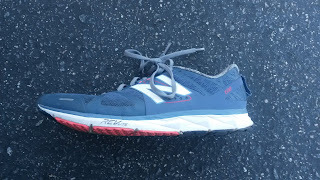 All that aside I have enjoyed using this shoe for longer workouts and long runs in the attempt to prepare my legs for racing long distances in lower drop shoes. Even still I personally would not use this for a 5k-10k race. For a half to full marathon this racer would be perfect. Thoughts as a DPT (Student): No major complaints or biomechanical flaws that I can find. I do wish there was an Achilles split on the heel tab. However the lack of a heel counter makes up for this. The posting in the midfoot is pretty minor and is supportive without being overbearing. The toe spring isn't too major and I don't notice it. I do wish the midfoot was filled in a bit more instead of New Balance adding the T-Beam in the midfoot. I don't feel like the T-beam contributes to anything except making the 1500v1 feel a little more stiff. Instead I would fill in the midfoot a bit because a wider base is an inherently more stable base. I do understand that a narrower midfoot saves some weight, but at 7.3 ounces is already pretty light for a marathon racer. As I mentioned previously, I really appreciate the use of the diagonal pattern in the midsole of lateral heel. The pattern helps give this shoe such a smooth ride that I even use the 1500v1 as my casual recovery shoe (hence why the shoes in the photo don't have the insole in them. Those are my retired pair and I usually take the insole out to give me more room for casual use). I am extremely picky about how the shoe feels during the initial contact phase of running gait. The calcaneal bone of the heel (aka your heel bone) does have a curve to it to smooth out the landing during the initial contact phase of gait. The curve contributes to what is called the Heel Rocker, which uses gravity and momentum to keep the body rolling forward without additional energy. It is one of the many aspects of human anatomy and biomechanics that make human gait so efficient. When you remove it with sharp lateral heels and extended heel midsoles, that rocker is removed. This leads to increased forces through the lower extremity and a less efficient gait. I have talked about this before and one of the biggest offenders has been Asics (specifically the Asics DS Trainer). I love the Hyperspeed series and am really looking forward to the updated DS racer, but this aspect has kept me away from their trainers for the most part (if Asics sends me free shoes though, I will still happily train in and review them). New Balance combines the mild heel curve with this compressive effect for a very smooth ride that I have come to enjoy. Other than some minor grievances, I am really enjoying training in this shoe. I am very excited to see what happens with version 2. I'm hoping that the 1500v1 gets the midsole plate that makes the 1400 and new 1600 so responsive but we shall have to wait and see. Conclusion: This is a great first version from New Balance. The 1500v1 adds a fantastic lightweight, light stability longer distance racer to the market alongside the Saucony Fastwitch. The fit and upper are great and the light support combined with decent cushioning will keep you going on longer runs, workouts and races. I would definitely try these on in store to figure out the perfect size, but highly suggest giving them a try! 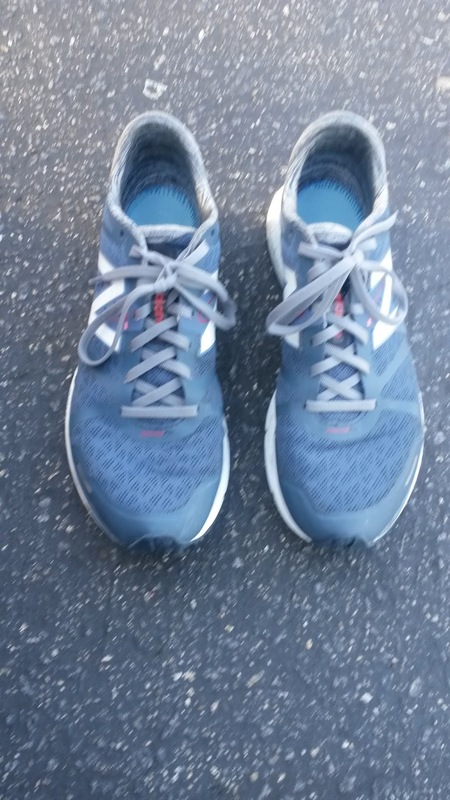 These shoes were a provided for free after winning the Taylor's Wish 5k in 2015 from A Snail's Pace Running Shop. I put at least 100 miles on every pair of shoes before I review them (except racing flats which I put on at least 50 miles). Currently I have 170 miles on my first pair and 20 miles on my second pair.